Tenuta Il Poggione is one of Montalcino’s largest wineries, founded in 1800 by the Franceschi family. 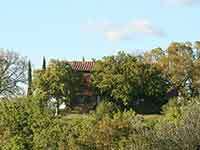 In 1890 the Franceschi family purchased the Il Poggione estate in Sant' Angelo in Colle. Tenuta Il Poggione covers an area of 600 hectares, of which 125 hectares are planted with vines. Brunello di Montalcino Riserva Vigna Paganelli is produced only in the best vintages and in limited quantities. This Brunello comes exclusively from the oldest vineyard on the estate, I Paganelli vineyard, planted in 1964. The Brunello di Montalcino is produced exclusively from Sangiovese grapes from vines at least 20 years old. The Rosso di Montalcino is made entirely from Sangiovese grapes sourced in the estate’s younger vineyards. The Rosso di Montalcino Leopoldo Franceschi ages in large barrels and barriques for 12 months, before being aged in the bottle. The Rosso di Toscana is a young wine produced from Sangiovese and Merlot grapes. Bianco di Toscana is produced with Vermentino and Chardonnay. Lo Sbrancato is a rosé wine made with 100% estate grown Sangiovese grapes. Its name comes from the homonymous painting from 1888 located in the winery’s tasting room. Other wines include Pinot Grigio Leopoldo Franceschi, Vin Santo Sant'Antimo Riserva, Moscadello di Montalcino, Grappa di Brunello and Grappa di Brunello Riserva Vigna Paganelli. Photo by lombiedezombie (source http://www.panoramio.com/photo/57497032), licensed under the Creative Commons Attribution 3.0 license. 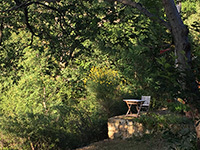 Podere Santa Pia is located in a strategic position, only a short distance from a large number of sites of historical and cultural interest. Numerous towns and villages offer a treasure trove of history and are waiting to be discovered. The central location of the holiday home allows you to visit the nearby villages Montalcino, Sant’Angelo in Colle, the Abbey of Sant'Antimo, Pienza, S. Quirico d'Orcia. Drive through the magnificent hills of the Montecucco and Brunello wine region all the way to Montalcino, and enjoy the beauty of villages and hamlets along the way. Take a stop at Castel Porrona, still preserving its noble appearance with timeless style and grace, then continue to Castelnuovo dell’Abate where the travertine romanesque church Abbazia di Sant’Antimo is an absolute must. Then loop back on the strada bianche or dirt road to Sant’Angelo in Colle and have lunch at Il Pozzo or Il Leccio. A different choice would be to stop a little further in Sant’Angelo Scalo, at Caffè Sant'Angelo. This Itinerary takes you to some of the best Brunello wineries on the southern slopes of Montalcino. Leaving the city through the Porta al Cassero, you walk along La Gerla, Paradisone ‘Colle degli Angeli’, La Gerla, Canalicchio di Sopra, Lazzeretti, Casanova di Neri, Casello, Fattoria Pian dell'Asso, before reaching the famous group of cypress trees.